These days, you can get a capable 2-in-1 for under $500 and one with formerly expensive features such as an SSD and a 1080p display for under $700. However, even those specs and a shiny exterior won’t get you a premium product in this price range. Starting at $450 ($650 as reviewed), the Pavilion x360 has the fancy-looking gold chassis and solid performance you’d expect from a high-end device, but it also has the dim display and heaps of bloatware that you find on midrange laptops. 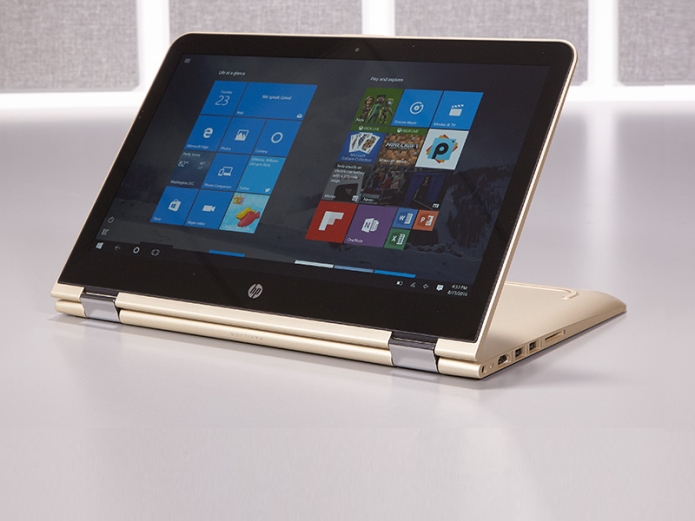 In the end, HP’s 2-in-1 is a reasonable choice for consumers with modest budgets, but it doesn’t do much to stand out from the pack. The Pavilion x360 took its design cues from HP’s flagship notebook Spectre, but reversed the color scheme. The shiny gold plastic lid, with its reflective HP logo, is rather ostentatious. Opening the laptop reveals a black plastic deck with a wood-grain pattern, an island-style keyboard with gold keys and a 13.3-inch, 1080p display surrounded by a thick bezel. I found the combination to be a bit loud (I find the Spectre to be more refined), while a few of my colleagues found it less offensive, and one absolutely loved it.